In preparation for the GMU Summer Program in International Security, this week we will highlight the course directors. EARLY BIRD REGISTRATION HAS BEEN EXTENDED TO JUNE 15! Register by June 15 to save $300 on a three-day course and $200 on a two-day course.. Use the links below for more details including registration. Questions? Comment to this post or email spis@gmu.edu. Dr. Sonia ben Ouagrham-Gormley, Associate Professor of Government and International Affairs and member of the Biodefense faculty at George Mason University, is the director for this summer’s WMD Export Controls course in the Summer Program in International Security. This course will run July 10-11 and aims to increase participants’ awareness and understanding of WMD proliferation, export controls and trafficking of related materials. Dr. Ouagrham-Gormley’s research and teaching focuses on WMD and proliferation issues. Her recent publications include “The social context shaping bioweapons (non) proliferation,” “An Unrealized Nexus? WMD-Related Trafficking, Terrorism and Organized Crime in the Former Soviet Union,” and “Banking on Nonproliferation: Improving the Implementation of Financial Sanctions.” Her forthcoming book from Cornell University Press, Barriers to Bioweapons, extends on her article by the same name and provides the most detailed examination to date of how and why biological weapons programs succeed or fail. 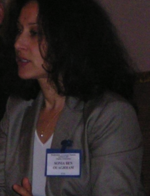 Prior to joining George Mason, Dr. Ouagrham-Gormley served 10 years as a Senior Research Associate at the Monterey Institute of International Studies, Center for Nonproliferation Studies (CNS), and Editor-in-Chief of the International Export Control Observer, a monthly newsletter devoted to the analysis of WMD export control issues in the world. Dr. Ouagrham-Gormley was also an adjunct professor at the School of Advanced International Studies (SAIS), Johns Hopkins University, where she taught a course on WMD in the former Soviet Union (FSU). She received her Ph.D. in Economics of Development at the Advanced School of Social Sciences in Paris, France. Click here to register for WMD Export Controls.